In conjunction with Bruce Nauman’s Days, SOUNDWORKS presents a series of sound submissions by a hundred artists from around the world. Murmurs, Mutters (2012) presents a hovering tension of an operatic voice, accompanied by countless voices, whispers, in French, Vietnamese, Mandarin, Cantonese, Portuguese. Recordings of ghostly voices, found spirits and found utterances complete this sonic picture. 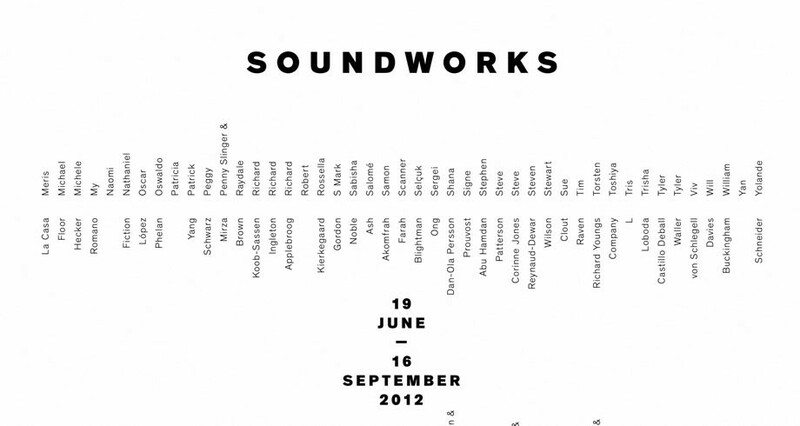 One hundred new sound works have been produced by artists from all over the world. Selected by our curators and art institutions worldwide, the artists have been invited to submit a sound file, taking its stimulus from themes evoked in Bruce Nauman’s Days, presented concurrently in the lower gallery as part of our season on sound. SOUNDWORKS embraces the ephemeral nature of sound, and presents an online platform that doubles as a virtual exhibition space. This site aims to make the works internationally accessible, a place to explore the genre as a medium which is simultaneously inclusive, interactive, and subversive. It includes a wide range of audible approaches by artists who have been working with the medium for many years, as well as artists taking their first venture into the sonic arts.